Microsoft last week confirmed that it has stopped letting business customers block the Windows Store in Windows 10 Pro, removing a feature that had been present in the operating system's initial summer 2015 release. Instead, the ability to turn off the Store -- Microsoft's distribution channel for not only apps but also games, music and movies, and about as consumer-grade as a Windows component gets -- has been restricted to Windows Enterprise, the top-tier SKU (stock-keeping unit) available only to large customers. IT administrators had been using Group Policy to block the Store within Windows 10 Pro, largely to keep workers from installing apps not on their company's approved software list. Some admins, however, had ditched the Store for other reasons, including bandwidth consumption as scores of apps frequently updated. When asked to offer a rationale for the change, a Microsoft spokesman said, "As we design Windows 10 as a service and bring new offerings to market, we learn from customer feedback about the types of service, control and access they need to manage their environments and we make decisions based on that feedback." Microsoft has heavily relied on the "customer feedback" refrain when questioned about its Windows 10 decisions, even those that have been loudly criticized by customers, such as 2014's removal of the popular "placeholders" feature of OneDrive in Windows 10. When 10 debuted in July 2015, administrators could set Group Policy for Pro to made it impossible for employees to reach the Windows Store. But as soon as Microsoft released version 1511, the November 2015 major upgrade, customers began reporting that Pro no longer let them block the Store. "I'm inclined to think that this is a bug, but I'd love to hear suggestions if anyone has any," said a stymied tsew2674 in a Microsoft support forum on Nov. 21, 2015, about two weeks after 1511's release. Users were puzzled, and traded suggestions in the discussion threads about how to stifle the Store. Eventually, it dawned on them that 1511 had retracted block-Store-on-Pro. By mid-December at the latest, word circulated on Microsoft's TechNet website, aimed at IT professionals, that Microsoft had blocked the blocking with the November upgrade. The fact that numerous news stories and blogs reported on the change only recently was likely due to its increased visibility as 1511 landed on a much larger number of Windows 10 Pro PCs after Microsoft promoted the November build to the Current Branch for Business, the release track that many companies with Windows 10 have adopted. Microsoft did not suddenly switch on the change this year. 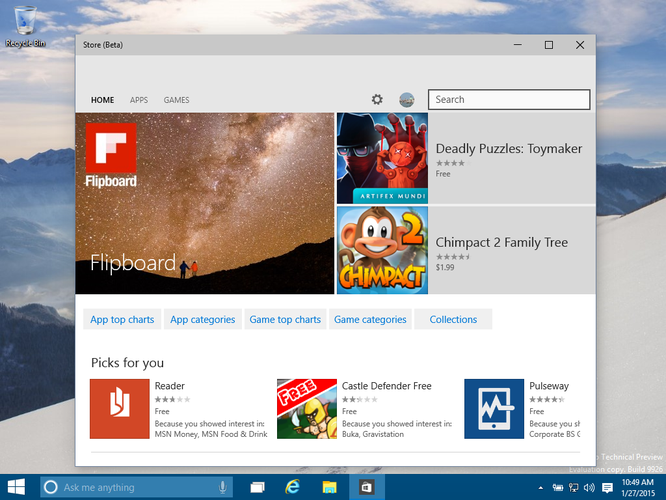 Customers, some of whom had relied on on blocking the Windows Store prior to November, were frustrated that the option had been eliminated. "Our Windows 10 implementation has come to a screeching halt until this is straightened out," said someone identified as sckbassg3 in message on a TechNet thread before it became clear that the removal of the Store blocking ability was a feature, not a bug. "I assume ad revenue from the Store is the reasoning behind this, but it seems like a pretty low-blow, there are lots of businesses out there not running Enterprise editions of Windows," added tsew2674 on the same thread last year. "As an admin, you deploy Windows 10 Pro to your users with a GPO [Group Policy Object] to turn the Store off that worked, and then an update comes out and enables the Store allowing your users to install games, apps, etc.," said Bulldogs111 last month in a different TechNet thread. "This is an escape that will make any company question whether to deploy Windows 10 to their environment since they don't know what could change next." Microsoft admitted that removing Store blocking from Windows 10 Pro -- making it Windows 10 Enterprise-only -- was to cast the latter as the preferred business edition. "Windows 10 Enterprise is our offering that provides IT pros with the most granular control over company devices. Windows 10 Pro offers a subset of those capabilities and is recommended for small and mid-size businesses looking for some management controls, but not the full suite necessary for IT pros at larger enterprises," a company spokesman said in a statement [emphasis added]. "The ability to block access to the Windows Store is typically for organizations who want more control over corporate-owned devices. This fits into the value of Windows 10 Enterprise." Customers can also block Store apps using AppLocker, but like the Group Policy approach, that too is an Enterprise-only feature.